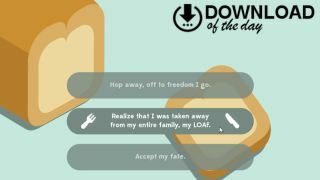 A Day in the Life of a Slice of Bread is a bizarre text adventure, and it's available to download and play free from Itch.io. ADitLoaSoB (a catchy initialism if ever we saw one) presents you with a series of choices that help you determine the fate of a sentient bakery product. Will he become a productive member of society, or is he toast? Without giving too much away, the game's opening is surprisingly dark and existential, focusing on the limitations of your life as a slice, but persevere and things soon start looking up.